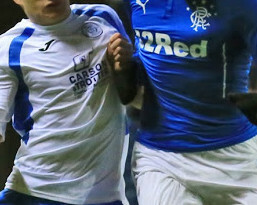 It took an excellent strike from Rangers substitute, Kenny Miller to give the league leaders all three points in today`s Championship clash at Palmerston, but Queens can hold their heads up high after they more than matched the Glasgow giants for large parts of the game, and in fact on chances created, they certainly deserved to take something from the encounter. In an evenly matched first half both sides went close to scoring with Queens going closest when a tremendous effort from Lewis Kidd crashed against the crossbar, however despite a valiant second half performance Queens just could not find their way back into the game, as they were beaten at home for the first time this year. 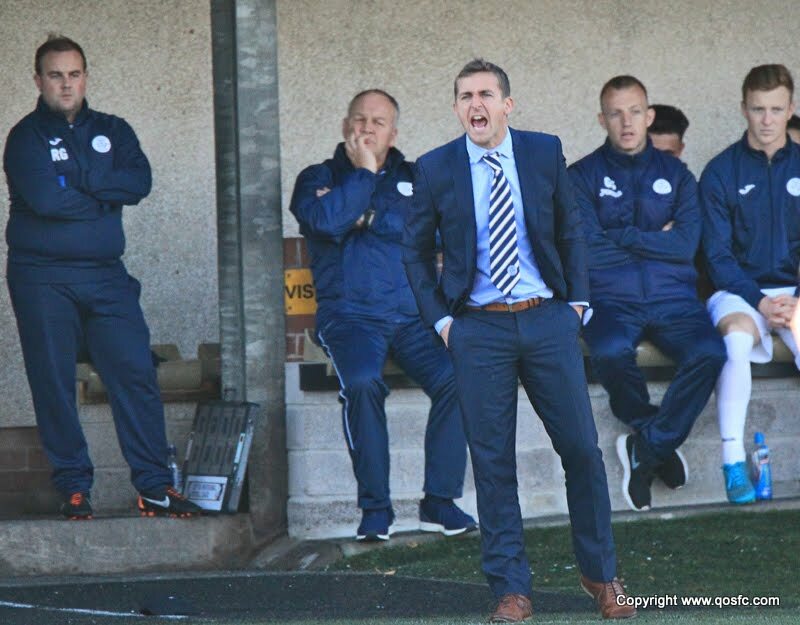 With Andy Murdoch not able to play against his parent club, Mark Millar returned to the starting line-up at his expense, and this was Queens` only change to the team that started against St.Mirren. Former Queens star, Nicky Clark, led the line for Rangers along with recent signing Michael O`Halloran. A healthy crowd of 5449 saw the away side start the game in front of the Sky Sports cameras, and straight from the kick-off O`Halloran broke clear of the Queens defence before shooting high over the bar from a very tight angle. At that early stage even the most optimistic of Queens fans might have expected the afternoon to be a difficult one for their team, but Queens responded well and following a free kick, they won their first corner. 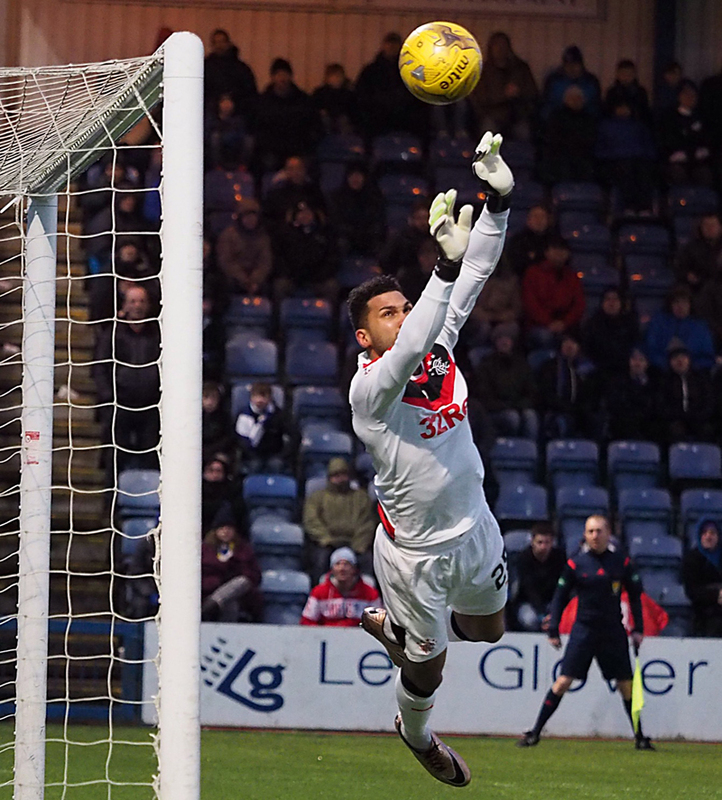 Mark Millar`s delivery to the back post picked out Derek Lyle whose header was pushed out by `keeper Wes Foderingham. The visitors won their first corner following their next attack and Jim Atkinson made a fine confident catch taking Halliday`s kick ahead of the challenging Clark. With 12 minutes on the watch, Rangers were awarded a free-kick just outside the box after a foul by Andy Dowie, and although Tavernier got his shot on target, Atkinson made a comfortable save, palming the ball over the bar for another corner. This time the set piece caused problems for the Queens defence and they were grateful that King was unable to connect with the ball as it bounced in front of him just six yards from goal. The visitors were now seeing more of the ball and prompted by Halliday and McKay, they increased the pressure and mid-way through the half they almost took the lead. A shot from Halliday was spilled by Atkinson and fell into the path of Clark, but the Queens `keeper recovered well to block Clark`s effort and keep the ball out. Queens were forced into an early change just past the half an hour mark when Derek Lyle succumbed to what seemed to be a muscle injury, and Iain Russell replaced him. 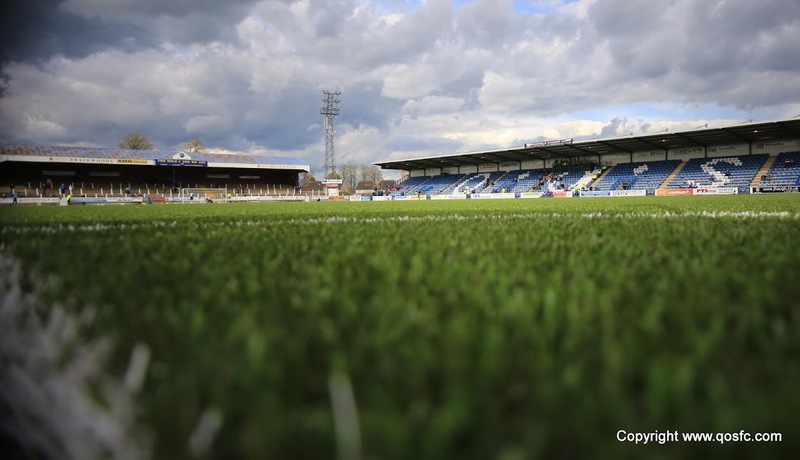 Mark Millar became the first player to be booked following a late challenge in midfield, and then O`Halloran drove an effort into the side netting as the game became stretched for the first time. Rangers went very close themselves following a quick counter attack, but Atkinson did well to keep out O`Halloran`s low drive. Right on the stroke of half-time Kyle Hutton conceded a free-kick a couple of yards outside of the box to set up part two of Tavernier versus Atkinson, and as in part one, it was the Queens `keeper who came out on top, tipping the free-kick over the bar for a corner. Queens almost got off to the best possible start early in the second half when an error from Kiernan let in Jake Pickard, but Foderingham kept out the Queens youngster with his legs. The play was moving from end to end as each team took it in turn to attack. A quick Rangers break saw Tavernier deliver a wonderful ball across the 6-yard box that was only just too far in front of Holt at the far post, and then Wallace drove a shot tamely into the arms of Atkinson. Chris Higgins and Andy Dowie were coping well with both Clark and O`Halloran, although Higgins did earn himself a booking following a mistimed challenge. Queens then went from defence to attack in seconds as Alex Harris showed a tremendous burst of speed to get himself inside the penalty box, but unfortunately for Queens he had no support and when it finally arrived in the form of Millar, his shot from the edge of the area went wildly off target. Rangers went to their bench and made a double - and hugely significant - change on the hour mark. Clark and King were replaced by Shiels and Miller, and it was the latter who would be the eventual matchwinner. In fact the former Scotland man had only been involved in the action for three minutes before he scored what turned out to be the game`s only goal. Collecting the ball from a throw-in on the right he tried what can only be called as a speculative half volley, and he was as surprised as anyone to see his shot dip at the last moment to drop over the head of the dis-believing Queens `keeper.It was one of those goals, 9 times out of 10 the ball would have flown over the bar, today it fell kindly for the league leaders. The goal against them however seemed to give Queens a boost, and for the last 20 minutes of the game they were the better side, and they were extremely unlucky not to take anything from the game. Kyle Hutton became the third Queens player to be booked, but that was the only negative for Queens during the final moments as they did everything but score. Gary Oliver - who came on for Millar after 69 minutes - added an injection of pace to the attack, and when Halliday fouled him right on the edge of the box, it created a shooting opportunity for Conroy from the set-piece. Conroy`s kick beat the wall but not Foderingham who threw himself to his right to push the ball away. Queens went close again, and Oliver was involved once more. After jinking his way past Wallace he fired the ball towards goal only to see it cannon back towards Kidd just inside the box, but Kidd snatched at the opportunity and blazed the ball over the bar. 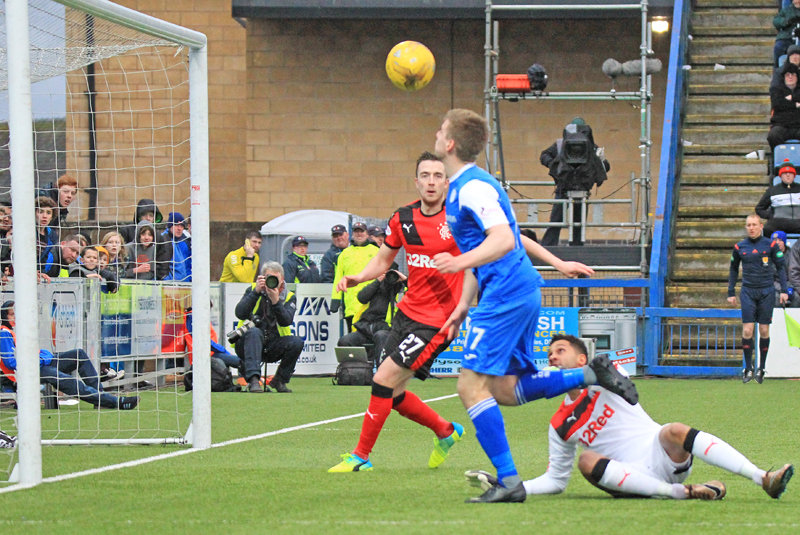 The hosts continued to attack and excellent play from Iain Russell found Oliver who in turn set up the chance for Harris, but last weekend`s goal hero was off target with his strike this time round. That was Harris` last involvement in the game as he was replaced by Aidan Smith for the final 7 minutes. After weathering the storm, Rangers almost sealed the win in bizarre circumstances when Halliday`s shot from distance slipped through the hands of Atkinson but fortunately for Queens, smashed against the bar. 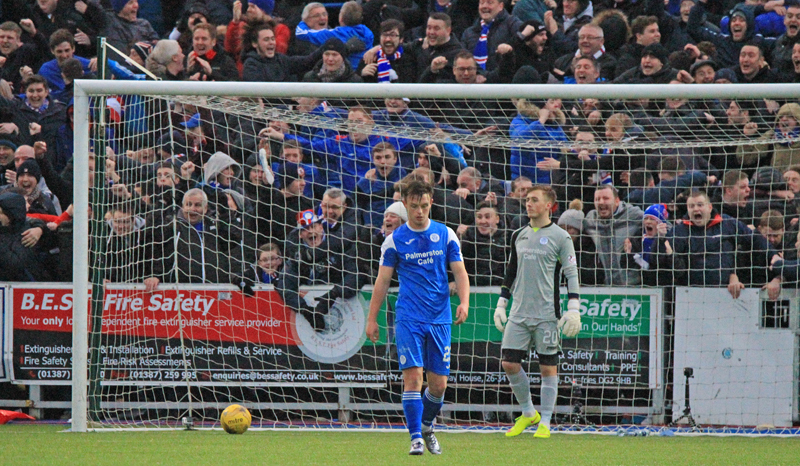 There was still time for Queens to grab an equaliser and they almost did - twice before the final whistle. Firstly Foderingham saved well from a Higgins near post header, and then with their final attack of the game they went close again. The pace of Aidan Smith caused some panic in the Rangers defence as he got in behind Kiernan whose push on the Queens striker earned him a caution, and Queens a very promising set-piece position. From the free-kick, a training ground routine saw everyone move toward the near post as Conroy delivered the ball to the far post. His cross picked out the unmarked Dowie, but his header back across goal landed on top of the net. That would have been a fitting finale to the game for both Queens and Dowie, who was named as sponsors man-of-the-match. So it wasn`t to be for Queens despite a spirited performance - especially in the second period - when they were unable to find the equaliser that their play merited. 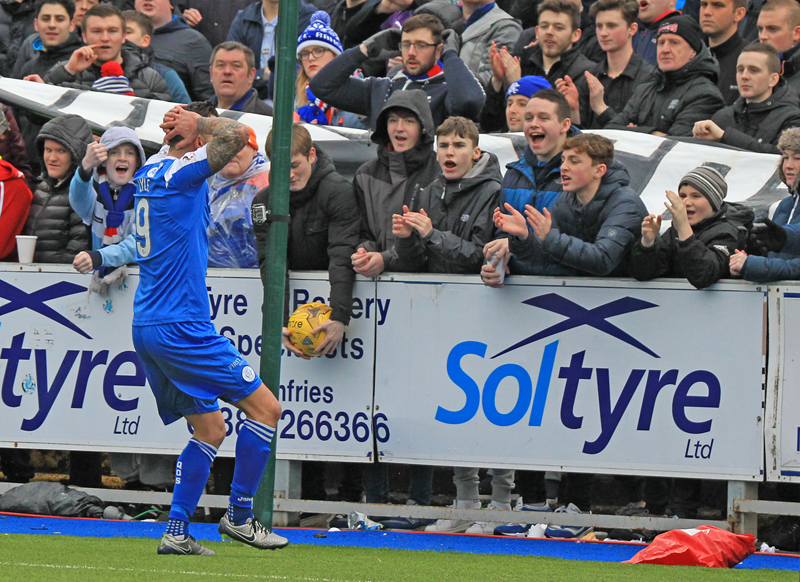 On another day it could have been Queens who were celebrating, Lewis Kidd`s strike goes under the bar instead of hitting it, and Kenny Miller`s volley goes over the bar instead of dropping into the net. Those are the tiny margins which make the difference between winning and losing, and today those margins did not favour Queens. 15:30 One change for Queens this afternoon. Mark Millar replaces Andy Murdoch. 15:33 Remember this afternoons game is LIVE on Sky Sports 1 HD in less than half an hours time. 5 min A promising start for Queens. Hutton`s header early on is inches wide of the target. 12 min Tavernier`s free-kick from 20-yards out is tipped over the bar by Atkinson. 13 min McKay misses a glorious chance to open the scoring but he scuffs his shot into the arms of Atkinson. 21 min Atkinson spills Halliday`s shot into the path of Clark but the keeper makes up for his mistake with a superb save to deny Clark. 33 min Iain Russell replaces the injured Lyle. 41 min Kidd has a strike from 30-yards out and it rattles the woodwork. Superb effort but still goal less at Palmerston. 44 min Tavernier has another free-kick tipped over the bar by Atkinson. 48 min Pickard shot is saved by Foderingham and out for a corner. 49 min Attendance this afternoon is 5,449. 62 min Rangers take the lead as Miller unleashes a stinging volley into the back of the net. 73 min Conroy`s free-kick is tipped wide by Foderingham. 75 min Kidd blasts an effort over the bar after a scramble in the Rangers penalty box. 86 min Conroy`s corner finds Chris Higgins and his header is saved by the keeper and out for another corner. 88 min Three minutes of added on time here. 90+2 min A late chance for Queens goes begging as Dowie can`t get his header on target. 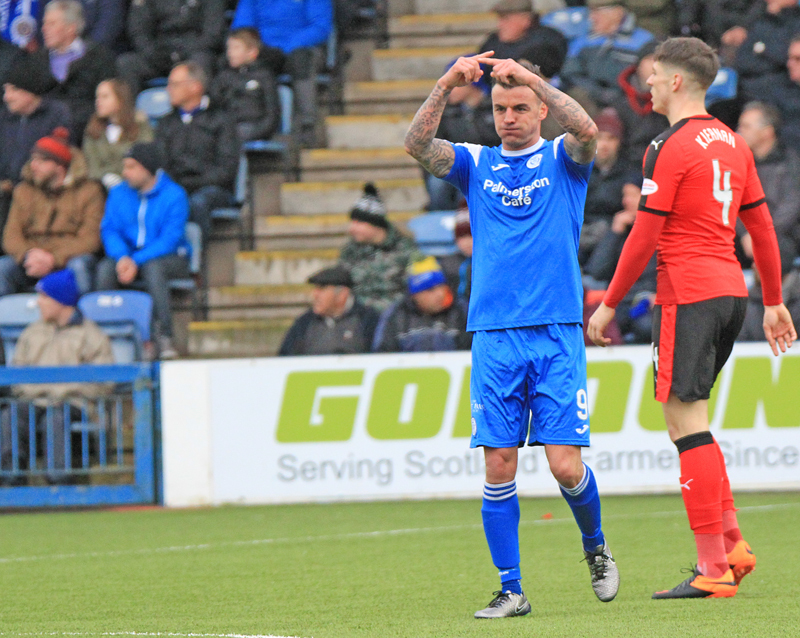 17:49 A second half goal from Kenny Miller is the difference here at Palmerston. Queens 0-1 Rangers. 17:50 We are back in league duty on Saturday 27th, away to Falkirk.